While I have been happy and fulfilled in both design and engineering roles, for this conversation, I choose to specifically focus on the UX and PM paths as they are paths that I believe will cement the importance of user experience within organizations of all sizes. For the purpose of this post, the exact titles aren’t important; they can vary widely by organization. So, I’ve selected some general titles for the purpose of illustrating my thoughts. So with that, let me lay out the paths, building atop my previous post. We all start as individual contributors. The role is where we learn the details of our chosen profession and the differences between theory and practice. This group includes positions such as UX Engineer, Junior Product Manager, Senior UX Designer and Architect. For many this is an ideal role for the long run, free of management responsibilities and able to focus on what they are most passionate about. It’s important that we as an industry make it clear that those who love what they do can be productive, and well compensated for delivering time and again. I despise the numbering that you often see in large organizations (Designer II, Programmer IV) to address the roles. “Senior” is a good designation to provide some recognition and separation, but that dead-ends pretty quickly. I don’t have any recommendations for the next step. For that matter, do we even need a next step, or is it perfectly acceptable to keep this at two-to-three ‘levels’, assuming that the compensation reflects the skill set of the individual? I think so. For more advanced Contributor roles, such as a Lead or Architect, use ‘soft power’ to influence the team and improve the product. What do you think belongs here? I’d love your feedback in the comments. No matter the starting point, there is a parallel progression for most people within their field: gain experience and move up a couple of levels while staying an individual contributor. For those interested in new challenges, lateral moves are often available – from pure visual design, to focusing on wireframes and workflows, or from front-end coding to back-end coding. There is also the possibility to shift from implementation (design, UX and coding) toward business ownership (PM), which is a natural progression for those interested in increasing their impact on the product being built and the business as a whole. It is also a natural move for people who wish to broaden their knowledge as preparation to start their own company one day. This is the first large step for many people, and when managing a small team, it is a player-coach role – you’re managing people, but still working on deliverables yourself. Responsibilities shift from direct execution (I need to complete this wireframe) to working with others to produce optimal output, which can be frustrating, especially when it feels easier to do the work rather than hand it to someone more junior. At the same time, this role can be enormously rewarding, as the new challenges that come with managing people is balanced by familiar work that relies on established expertise. Execute – the player-coach is still designing, wireframing, coding or writing specs. But not as much as she used to, given her expanded responsibilities. The work that the manager chooses to do herself, compared to that which she divvies out to the team is telling. A mature manager will distribute work to the appropriate people on her team to ensure that they are challenged and can grow. She does not take the fun projects for herself. Celebrate team wins and highlight individual accomplishments. Realistically analyze and correct failures. There are several different options available at this juncture. Many people moved into management as it seemed like the only viable option or the best way to gain recognition and compensation. If those are the driving reasons for the move, odds are good that it was a poor choice, which I hope can be rectified with a shift to a strong Individual Contributor role. Leadership can be rewarding for many, so for those who enjoy it, moving up will require a shift in focus and expertise. Shift to a Contributor role – managing humans is not rewarding for everyone, so it is often the right move to return to a position that harnesses the individual’s passion. This grouping can cover a few different sets of expectations and team configurations, depending on the size of the organization. For the purpose of this post, it assumes that the role is focused on managing people, with direct contribution toward individual projects being exceedingly rare, with the time spent focused on the team and working on higher level projects for the business. Exact titles aside, it covers a couple of different types of roles: a manager of a team of individual contributors, and a manager of managers. It is at this point, that a marked shift in skills is required for the job at hand. While you might still design or code, more than likely, it’s on the side, or on an unimportant project that you’ve adopted. Implementation knowledge that was once so critical, is far less important than building the skills required to lead the team, work with extended parts of the business and ensure the success of the individuals you manage. More time will be spent on strategic, occasionally ephemeral decisions than on the hard, tactical choices faced earlier. It can be a lot of fun, yet very, very frustrating. Beyond that, your success is much more dependent on the execution of others than at any time before. Your career is now built atop those that you lead, so if you don’t make them successful, your own path will become much harder to navigate. At the same time, your career is now highly dependent on the relationships you’re building with your colleagues at every level elsewhere in the company. These are the top most positions within a specific field, typically including titles such as VP, Senior Vice President, Executive Vice President, General Manager or Chief. In the last decade, we’ve seen product executives rise and we now see the UX career path following the same trail. 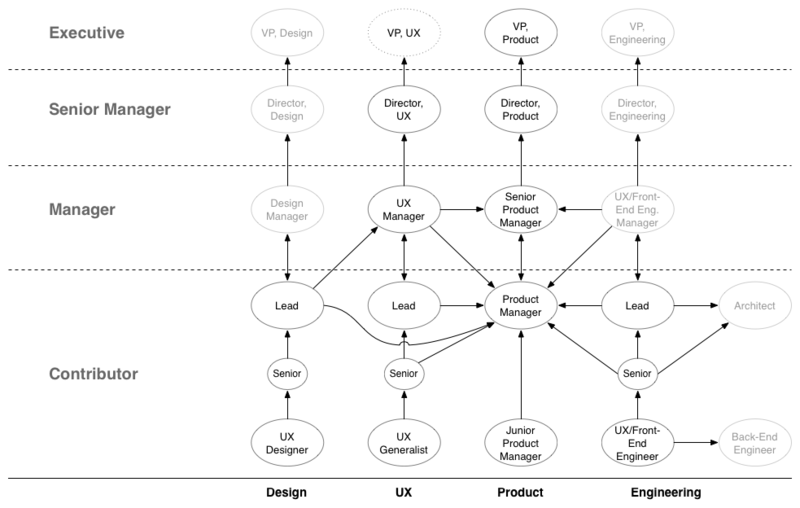 While it is still rare to find a VP of UX, much less a Chief Experience Officer, I expect they will become more common. In some cases, the skills and experiences of the two will merge, which is a key reason that I’ve personally taken the path that I have. Regardless of whether the title includes “UX” or “Product”, I think it imperative for company leadership to include an exec infused with both skill sets to truly encompass product and market needs. In the case of UX, now is the time for trailblazers. In this case, responsibilities include everything laid out under the Senior Management section above in addition to these points. You’re pretty much at the top of the career path, having developed a very different set of skills than you expected to along the way. This is where this post stops, as CEO is a viable career path for some, it requires a significantly different skill set, and while I’ve seen great, and horrible CEOs, and read a few business books, I’m not qualified to weigh in. What I would love, is to hear your thoughts on what I’ve laid out – am I on track? What did I miss? How does this match your experience?